As humanity faces the worst global refugee crisis since World War II, the challenge of ensuring that the proper rights and protections are granted to those with “refugee status” has been brought to the top of the agenda of heads of state, policymakers, and humanitarian aid workers alike. For one group of refugees however, the hope of their crisis being addressed has all but faded: Palestinians. For those living in Palestinian refugee camps in the West Bank, “refugee” is not merely a legal status, but a symbol of a painful and ongoing struggle for rights yet to be materialized. One such camp that highlights this struggle is “Al-Fawwar Refugee Camp,” henceforth referred to as Fawwar, which I was able to visit while working with a Palestinian community center in Hebron. Located in the South Hebron Hills, Fawwar is home approximately 8,000 Palestinian refugees housed in a space less than a quarter of a square mile. At the entrance of the camp stands an Israeli watchtower and an outpost hosting armed soldiers, who maintain a firm grip over the residents’ movements in and out of the camp. The soldiers often conduct raids into the camp, imposing blockades or curfews when tensions are high. At the entrance, one could be forgiven for believing they’ve entered a downtrodden town. A refugee camp is usually seen as a temporary dwelling for a displaced population with services designed to address the population’s immediate needs. It is also understood that if the conditions of displacement are redressed, the population can return home. 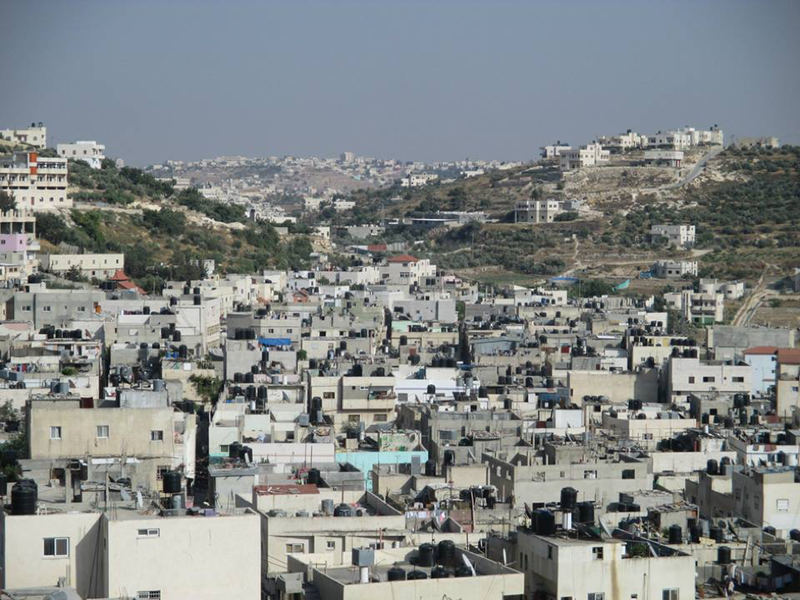 With no signs of redress or return in sight, Fawwar, like almost all of the refugee camps in the West Bank, has indeed become more of a town. Upon walking further, you pass by schools, mosques, and a line of stores that form the “main street” of Fawwar. Once you’ve passed the main street into more residential areas, it becomes difficult to distinguish between sidewalks and streets in Fawwar, because there is no room to have both. The narrow confines of the alleyways measure only a few meters, leaving very little space for both cars and people to move at the same time on most streets. The clustered homes and unequally leveled roads throughout the camp make movement much more suffocating. Fawwar’s facilities are subsidized by the United Nations Relief and Works Agency (UNRWA), which states that it bears responsibility for “providing services and administering its installations,” including medical and educational centers. The provision of basic services – which often, if not always, fall short – suffice only for survival, leaving virtually no chance for social or economic mobility. Workers are heavily dependent on working manual labor inside Israel, which entails traveling out of the camp and enduring the humiliation of checkpoints on a daily basis to reach work, often risking their lives in the process. These abysmal social and economic conditions are exacerbated by the yoke of Israel’s military occupation, which leaves Fawwar’s residents as victims of a vicious cycle for survival. As you walk through the camp, you will pass by homes riddled with bullet holes; homes filled with cement barrels after being demolished so that they couldn’t be used again; and wreckage from what remains of people’s homes. When a local tells you that “this used to be someone’s house before it was raided,” a numbing chill immediately drops down your spine as you are faced with the sobering reality of where you are. For many Palestinians, the establishment of the state of Israel in 1948 is inseparable from Al Nakba, or “The Catastrophe,” the displacement of hundreds of thousands of Palestinians from their native villages in what became Israel. Fawwar was established shortly thereafter, between late-1949 and early-1950, with the sole purpose of housing some refugees that originated from those villages. Many of Fawwar’s residents came from the Gaza, Hebron, and Beersheva areas, while others settled there after moving from another refugee camp, Al-Arroub. The few remaining inhabitants of Fawwar who’ve been there since its inception have lived to see at least two generations come after them. Inside Fawwar, if the locals are comfortable speaking to you, you may come across the few elderly men and women who still carry the keys to the homes they were expelled from in 1948, narrating painful stories of their ordeal whilst expressing faith in a future that gives them a right of return. For Fawwar’s residents, the Catastrophe is not a distant memory long forgotten, but a definitive characteristic that continues to shape their very existence. It is through the lens of this history that they see their present. As you listen to their stories, you begin to see how the presence of Fawwar, a camp of indefinitely exiled refugees, serves as a microcosm of the tragic politics that underscore the Israeli-Palestinian conflict. Fawwar was indeed established as a consequence of expulsion and war, but in spite of its reality, you will nonetheless find pockets of optimism. The camp’s walls are decorated with colorful murals depicting keys, flowers, and prayer invocations, signifying themes of freedom, hope, and faith. Fawwar’s residents still cling tightly to their keys, with the unwavering hope that they will have the freedom to return home one day. The children here are a source of faith for everyone else. Their jovial expressions, glistening smiles, and playful laughter represent an unwavering resilience in the face of relentless gloom and despair. They may not completely be aware of where they are or why they are there, but like all children, they possess an angelic bliss, not realizing that their gentle smiles are what keep everyone going. For Fawwar’s adults, the children make striving towards a brighter future worth it. As I depart the camp, I recall one young girl who noticed the sunglasses tucked into my shirt. Pointing to the shirt, she says, “you have two glasses, give me one!” Without hesitation, I hand them to her, wishing that I could do more. I wasn’t able to get the young girl’s name, but I will always remember her smile. As I depart the camp, I think about how, if ever, there can be a durable solution to this young girl’s plight and to the Israeli-Palestinian conflict. With previous peace deals all but dissolved, the rapid installment of Israeli settlements into the West Bank, and a political gridlock on all sides, sustainable progress towards a solution seems to be gradually fading. For many of Fawwar’s residents, any conversation centering around a solution is incomplete until the conditions that created the need for such a conversation are redressed. They hold that any sense of peace must be coupled with a sense of justice, and despite all of the odds pitted against them, their struggle to achieve both will always continue.